Life. Everyone has a different take on how life goes. Everyone has a choice which others must respect. One either looks at life positively or negatively. Whichever one chooses, it must be respected. If you ask me, if there are only two general choices, should I go to the side where I can stick & lose myself to things that I cannot reverse and continue losing more? Or should I go to somewhere I can move on and receive people or things that are already there for me to keep on going, gaining more happiness? I then choose to remain optimistic, thinking everything's a blessing. No matter how ugly it gets, I think of it as a blessing. Some may think that it's madness to even consider the worst heartbreaking scenario to be a blessing, but after some time (or after going through the usual Denial-Anger-Bargaining-Depression-Acceptance Coping Mechanism), I believe that I'll see the reason why it happened. It may take minutes, hours, days, months, or even years, testing one's patience and awareness, to see why a certain event may have even happened, but one must know how to get to the ACCEPTANCE stage. Emotions and logical reasoning get tested and if we fail, who gets affected? At the end of the day, it's just you who will be dwelling on either the good or bad feelings and you always have a choice. I know that it is hard to think positive during intense negative emotions. I am sure everyone has been there. But even though one is alone in feeling all of the overwhelming emotions, one is not really alone. There's a reason why we get surrounded by all forms of comfort and it is our choice to be aware of how to use them. Sources of comfort may come in forms of our beliefs, family, friends, pets, even facebook & blogging. I am writing this not to persuade or force people, rather, to at least just be an instrument of comfort to everyone who is going through difficult times. 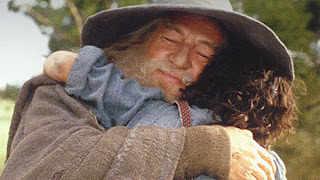 I want to be Gandalf for the mean time. He is such a great inspiration, especially after watching 4 whopping hours of The Lord of the Rings: The Fellowship of the Ring (EXTENDED VERSION). There's this scene wherein Frodo was wishing that all the hurtful negative things did not happen. Gandalf: So do all who live to see such times, but that is not for them to decide. All we have to decide is what to do with the time that is given to us. There are other forces at work in this world, Frodo, besides the will of evil. We can choose. We can decide. And we can choose for the better. He's correct when he says that there are other forces at work. Keep on the faith because after some time, we shall see the reasons why everything has happened. There are many learnings to make our future better and we just have to be open to them. Everyone has their own "burdens" (which I call blessings or learnings) because we are all unique and we have different paths. We are being molded in different ways through different problems/learnings because we all have different goals . Comparing our own problems to the other's problems will not help because we're all given different things for our own different futures. Take a career for example. Are we all going to be movie stars? Are we all going to be nurses? Are we all going to be a ring bearer like Frodo? Of course not. Therefore, we will all have to face different things for our different goals. We are all unique but we all have something in common. We all have a choice. "We can choose. We can decide. And we can choose for the better. He's correct when he says that there are other forces at work. Keep on the faith because after some time, we shall see the reasons why everything has happened." Cause everything happen for a reason. W/o any question. that's life. very unpredictable! Tuwing naririnig ko yung There's a reason for everything, lagi kong naiisip yung isang belief ko na kahit hindi logical or practical eh pinaniniwalaan ko pa rin, that everything has been written for us. It's not our role to question what is in store for us. I think there are more times in life when we are happy than when we are sad so that's enough reason to just be thankful that we existed. Kung totoong malapit na ang end of the world, then this post just magnifies that we should remain positive pa rin. i've had a lot of experience of being so down and suddenly somebody will just pop up without me noticing that i am already smiling. If there is one thing I have learned in my life, it is that Gandalf was usually right... and he was a pretty nifty dancer!